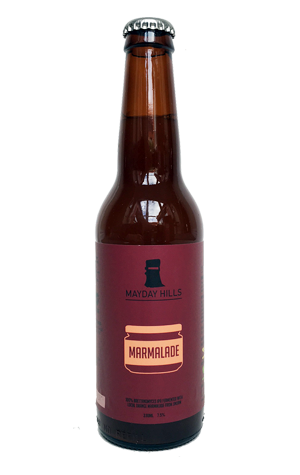 The Mayday Hills series of beers celebrating Bridge Road Brewers' local region is into its second year now, with Marmalade – beer number seven – continuing its simple naming regime. Marmalade features (no prizes for guessing) marmalade, specifically one made from oranges local to Beechworth by Jim Jam Foods especially for the brew. Prior to them being added, the beer went through the same process all Mayday Hills beers do – fermented with Brettanomyces in the brewery's large oak foeder. The beer itself is an IPA and, thanks to its murky, deep yellow appearance and thick, pungent aromas, is one you might initially take to be another entry into the NEIPA arena. Yet Marmalade is shot through with a slightly funky, drying character from the Brett (and, perhaps, the oak) as well as some Belgian-esque fruity, spicy esters that remind you it's something other. That said, the citrus derived from the marmalade and hops remains the dominant character, both in terms of overripe orange aromas and sharper citrus flavours.